To develop preliminary project budgets, planners use a benchmarking tool that draws on cost data of current and completed projects to quickly assess the potential cost per square foot of proposed work. 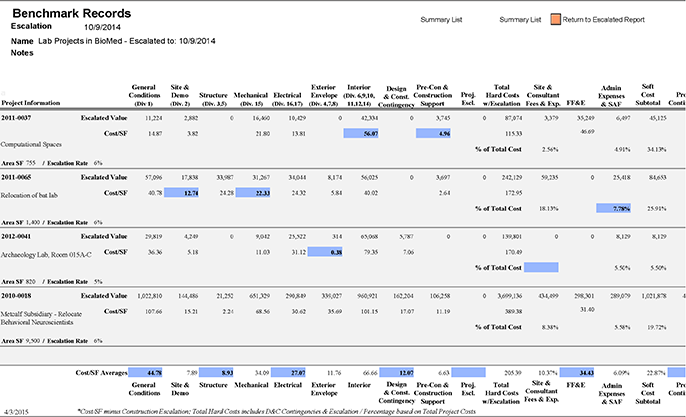 The data on overall project budgets are broken down into “cost centers” that bundle the costs of related work (e.g. interiors, electrical or design fees). Planners build new project budgets by benchmarking the proposed work at the level of the cost centers and then compiling their analyses into an overall estimate. This allows a more refined approach than simply benchmarking total project costs.